When we think of crop, vegetable and fruit damage due to “weather” we think of drought, too much rain and insect infestations. But it wasn’t necessarily a regular occurrence and the following spring and summer season, we would get out vegetation back. Either the perennial would grow back or we would plant another crop of wheat or barley. Today, many of our foods are heading for permanent extinction and some of them are not what you would normally place in this category. Foods such as bananas, maple syrup, honey and chocolate. Yes, chocolate. Attention all of us chocaholics. Let’s take honey first, as you’ve probably heard about this one. Bees make honey and it is the bee population that is shrinking. The culprit: Colony Collapse Disorder. It’s killed over one-third of the bees in the United States alone. Bananas are being felled by Panama disease. Back to the food. Considering all that is disappearing, we might be able to forget about dieting. But we might also have to forego being healthy. Back to the bees. They don’t just make honey; they pollinate a lot of our vegetables and fruits. Think: pumpkin, sweet potatoes, apples, almonds, blueberries, peaches, avocados, cucumbers, cranberries, onions, blackberries, grapefruit, raspberries and oranges. The list goes on. What is one to do? Extract the seeds from the fruit or vegetable and plant it the next year, then repeat the process? If the plant grows, that is. I purchase seeds from a Canadian seed company that does not treat its seeds. What if it and other seed companies no longer had seeds to sell? Which doesn’t help me with my two favourites from the above list – chocolate and raspberries. As some of you know I have a huge black raspberry bush which provides me (and my son, his girlfriend and my friends) with delicious fruit. I freeze the extra for winter use on cereal, or as dessert. 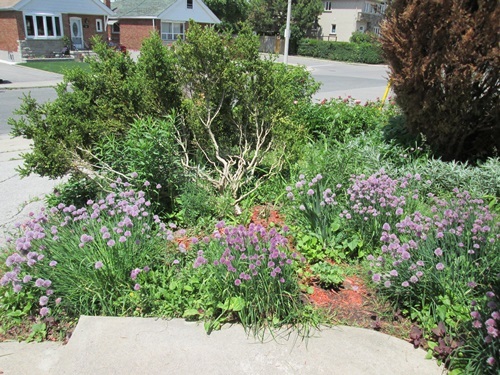 The bushes started as three small half metre plants I brought from my Aurora home to my Toronto home when I moved in October 1998. What happens if the number of bushes decrease instead of increase? Or worse still, suddenly die off? So, what is our answer? I only know that whenever I see a bee – honey or otherwise – busy in the flowers, in the blossoms, I say a “thank you” and give the bee its space to do its business. What do you think? Are you a chocaholic? You can read more about this at http://www.foxnews.com/leisure/2014/03/26/are-these-foods-doomed-to-disappear/ and scroll down to the links for other related stories. I come from a long line of gardeners – my late mother, her mother and father, my godmother, my godfather. Many cousins of my generation seem to have inherited this green thumb. Are green thumbs hereditary? And where the heck does the term “green thumb” originate? Two stories on the latter one. The most common is that back in the days of King Edward 1 of England, green peas grew in profusion in the King’s Garden. He loved the taste of green peas and had a number of serfs constantly picking them as they produced. That much pea-picking temporarily turned the serfs’ hands green. And legend has it that the King awarded a prize to the serf whose thumb was the greenest. Now I wonder, if this is the origin of prizes for garden shows – not just flowers, but vegetables. The other possibility is something that also happens – if algae has formed on the outside of earthenware pots, handling the pots a lot can make your hands turn green. So, today, a gardener who creates a garden that grows flowers, herbs, vegetables, seemingly with little effort, is referred to as having a green thumb. Whether the thumb actually turns green or not depends – on what the gardener is doing or if he or she is wearing gloves. And yes, I have a green thumb. With me it is part hereditary and part environment. As a child I used to pick raspberries, currants, strawberries and plant vegetables such as beans, carrots, and yes, peas. I don’t recall if mother ever had green-coloured hands. She did pick horrible green tomato worms off the tomato plants, put the worms in a can, come to the side door and show the worms to me. Yeck! No wonder I wasn’t too fond back then of collecting the tomatoes. Now, it is a different story. I watch tomato plants more than the racoons in the area, looking for blossoms, then green tomatoes forming, turning yellow and finally red. Right now the Tiny Tim tomato in a pot on my patio (and the pepper plants in pots too) has blossoms. I’m hoping the ones planted right in the garden will soon do so as well. 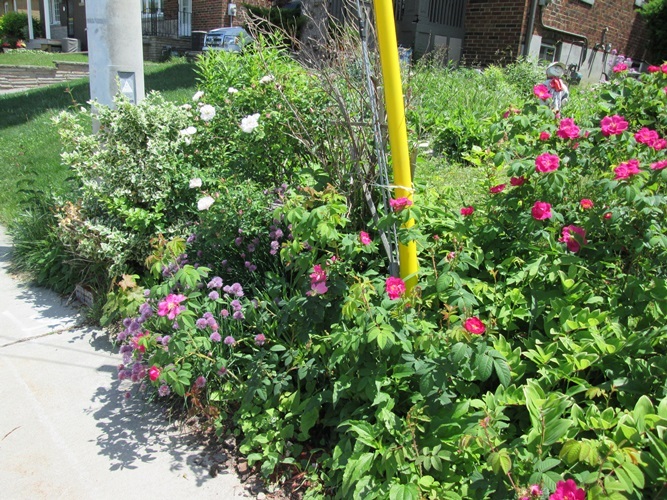 However, they were planted a few weeks later thanks to too much rain the first part of June. When I look at my garden I see that my late mom and I share what we plant and planted. No currants here but there are raspberries (although mine are wild black and hers were the ever bearing red ones), peas, beans (still just plants), carrots, onions, and rhubarb. I even have a few strawberries forming on a few of the plants my next door neighbour Phil gave me when he was removing them from their garden. I’m hoping the birds, squirrels, racoons, and insects leave me the strawberries. So I watch the strawberries a lot, too. And then there are the rosebushes, which grow prolifically, mainly in the front yard, but one white rose bush grows tall in the backyard. You gotta believe that heredity has something to do with this. Take a look for yourself. 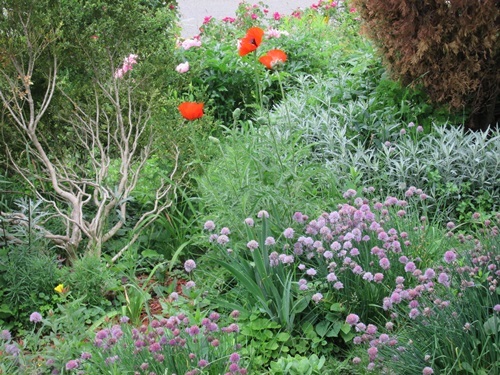 Today I am posting my Gardening Page live on this blog. I will add/change photos and text from time to time. Just click on “Only Child’s Garden” at the top left of this blog. Good fences make good neighbours. That old American proverb is playing out in my neighbourhood. Across the street a lady who has lived there with her son for a couple of years and hasn’t exactly been friendly with the neighbours is having a big, big fence built. She does talk to her next door neighbours, my friends Carol and Al. Good thing because at least she consulted Carol and Al about this fence. Al is keeping an eye on it and talks to the guy putting up the fence. Carol showed me this huge fence dividing the backyards. The fence looks over 8 feet high, well over the requirements for a backyard with a swimming pool, which this backyard doesn’t have…yet. The fence is solid wood, not lattice and continues at the back of this neighbour’s driveway at the entrance to her backyard. If I understood Carol correctly, the fence is supposed to extend along their neighbour’s driveway right out to the street. That means it will be against Carol’s lawn, making it look ugly. So far there has been no sign of this fence extension and the fencers haven’t been around for over a week. Fences around front lawns usually look awful. It makes me think the people are building walls to keep out everyone, as if to say – nobody allowed here except us who live here. Lower fences, ranch style in front look okay and if you have a corner property, higher fences are a good idea. People like to run onto corner properties and throw garbage on them. But make the fences the steel chain line ones. That’s what most of the neighbours on the corners have built. Contrast this with my neighbour behind my next door neighbour. Yesterday morning he was actively tearing down the old fence dividing his property and my next door neighbour’s. He was over in the next door neighbour’s backyard. As I picked the annual crop of black raspberries (yes it is that time of summer), I wondered if I should say something to him. But I didn’t’ just then. A bit later when I was sitting at my patio table and eating breakfast, he called me over. In his hand he held a bunch of invasive weeds which he had pulled. He started talking about that and we introduced ourselves. Gary has been there also two years and has been getting to know his neighbours since. He knew something about the neighbours behind me that I didn’t know. He offered to pull those weeds from my garden along the fence from my side – with my permission. I said I had done a big sweep pulling weeds before the raspberries came out, but give it a week or two and when the raspberries are finished he could do so. We also talked about the racoons who are taking over the neighbourhood and he said they even tore open a bag of bonemeal he had on his deck. I asked him if my next-door neighbours knew he was in their yard. He said, “yes” and the two of them were going to build the replacement fence together. A fence made of wood lattice – with open spaces in it. What a difference a neighbour makes. Good fences make good neighbours. Which neighbour would you rather have? You’re getting some garden photos today. From this spring and summer. Friends’ photos coming up in a future blog post. But both are connected in one way. I am grateful for both. First my friends, my real friends, not the so-called friends like “Lois” who think they can control my life. On Saturday, my friend Bob picked me up at the Finch subway station. We were en route to Aurora for an old newspaper journalist reunion. While driving, Bob told me he was glad I was finding some peace with that church I had blogged about recently. Bob said that he knows I have been through a lot in my life and he was hoping I would find some peace and that might be with that church. I replied “I plan to go back but there hasn’t been time.” He said he hoped that I would. I’m planning to this Saturday. Thank you Bob. I meant to tell you this on the way to Aurora, but the conversation got distracted and old minds sometimes operate like the proverbial gnats. 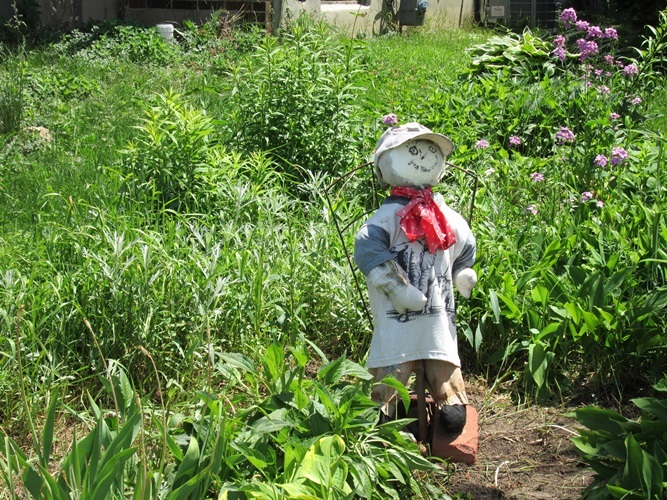 The garden is my refuge and my delight (weeds and all – you don’t want to know the number of containers and bags of weeds and tree and shrub branches in the last yard waste pickup). As I daily pick the many black raspberries, pot plants, water potted plants and just sit out and enjoy the garden while eating meals or reading or just sitting, I am grateful. Sure, we have had a lot of rain, but it has eased off the last week or so. Some rain and possible thunderstorms due later today so I hope I won’t be eating my words here. But when I see on TV and the Internet all those forest fires burning out of control in British Columbia, Alberta, Manitoba and Saskatoon and find out the number of people being evacuated, I guess we are pretty lucky here in southern Ontario, at least up to now. We have greenery, lovely flowers, and fresh food growing in the gardens and on the farms. Out west it is fire and smoke and air pollution and fear of losing your home. The Weather Network showed a map of the fires and within listed the culprits causing the fires. The furthest east was “Person caused.” The rest were caused by weather (read “God”). The sense of justice in me wants the guilty parties to pay. But we’ll never find the person who caused some of the fires. My hope is that God will bring the necessary rain (sans thunder and lightning) to put all the fires out. And keep the wind away. Unfortunately, current weather forecasts show T-storms and wind. 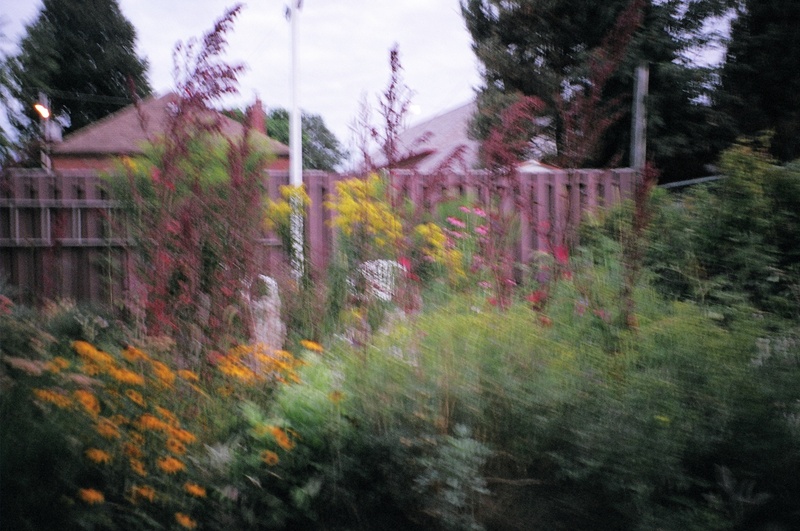 Meantime, back in gardenland here, I will continue to enjoy my garden. But still keep a couple of wary eyes on the weather.